Our company owns a service team that has rich experience and skillful technique and a blameless sales service network. Before customers purchase, we will send our engineers to customers site to design the reasonable flow chart; after purchase, we will wend our professional engineers to guide to install the equipment and take trial run. 2.Make efficient and reliable solution according to customers request and budget. 3.Produce equipment or special spare parts strictly following customers order. 4.Provide convenience to customers for the visiting at our factory as possible. 2.Assist customers to achieve an optimum installation scheme. After-sale Service:1.Experienced technicians guidance is available on the phone or internet. 2.One or more engineers will be dispatched to the quarry site to help install the customers plants. 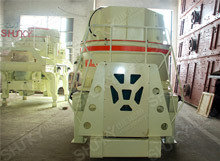 3.Provide necessary training about machine daily maintenance to local workers. 4.Monitor operational state of equipment and optimize the solving plans. 5.Seek for opinion of users to improve our service.